Apart from humour, what we read( or rather avoid reading ) to our children is influenced a lot by the value system we wish to inculcate. In my case, anything that offends my sense of justice, gender equality or is needlessly violent is taboo. And then there is the peril of over parenting. You do not want the innocence lost but it is important that children appreciate that they live in a not so equal world and there are all sorts of cultures and traditions which exist even if we do not personally subscribe to them. 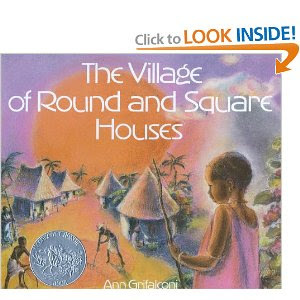 The Village of Round and Square Houses, caused some degree of dissonance but probably more in my mind than in my four year old- Anushka's mind. This African folktale is set in a real village, Tos, in Cameroon. It is entertainingly narrated by a girl, Osa, who belongs to the village. The unique trait of this village is that the women live in a round house and the men in a square one. The first half highlights Osa's typical day, in particular, the food habits, the division of chores and so on, as the men join the women and children in the round house in the village. The children help the women cook, and everyone eats supper taking turns in order, starting with the grandfather right down to the youngest child. This was a bit difficult to explain to Anushka, since most of us eat together at the table nowadays and if at all, the children would eat first ...The seating order which is respectful of elders was familiar territory. In the second half, Osa's grandma, much loved and respected, narrates a story on how the segregation of men and women into square and round houses respectively came about. Another important message in the tale is on nature. What seems to be nature's fury- The Naka volcano erupting- is in fact beneficial since the soil becomes more fertile. Unlike what the title suggests, there is no scope for teaching geometry through this story, though valuable lessons in geology, diversity and culture can be learnt. The illustrations are bright and vivid while depicting the happy lives of the people and dull and almost eerie immediately post the eruption and cheerful yet again once life returns to normal. The facial expressions of the grandma and the children really brings alive the story. And the vivid description of the food left Anush asking me to make fou fou sometime!! And yes, this book is a Caldecott honor book. Sounds really interesting. Where can I find one? Exactly my thoughts. You know what else bothered me? The adults smoking. I remember leaving a comment on this on ST before. Even now as I am looking at your review post, my older one identified the book cover pic and is saying that she wants to see the volcano erupting in this book and is asking me to put the book on hold. Like you say, the kids are more attracted by the pictures and not the subtle messages. Very fascinating. Is it easily available in bookstores? Although I agree that children do not have to be needlessly robbed of their innocence, I still am usually on the lookout for childfriendly books that gently introduce to them unsavoury concepts like gender inequality, caste and class inequality (the book by Kanchan Ilaiah reviewed by Chox some time back is a case in point), slavery, racism, poverty, holocaust, etc. I think children out to be at least told about these things in a way that does not offend their sensibilities. And then told that they do not necessarily have to subscribe to them, but they do exist. They will be facing them soon enough in the real world. Better to use sensitive books than the typical Bollywood-Hollywood fare that unwittingly exposes them to all this. Sorry for the long comment. Got carried away. Will look out for this one. artnavy - is this still followed in Cameroon? Well said, artnavy. Like utbt said, it is more my adult perspective that causes discomfort - to have to answer awkward questions, awkward for me as I have no easy answers... we've read Uri Shulevitz' How I Learned Geography - the repeat reads make me realize it has not affected my daughter in any adverse ways that I imagined at first... makes me muster up the strength to post it here one day. sheela- u must do that post and so must others here on books that they deem "different"
we can get over our sense of discomfort slowly but surely? ?